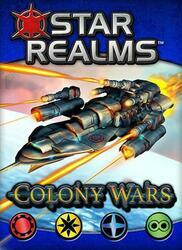 Colony Wars is the first Standalone in the award-winning game: Star Realms. It contains 80 new trade cards where you will find new ships and bases for factions that you have discovered with the basic game. These cards introduce new abilities. Star Realms Colony is compatible with the basic box, but can also be played alone. Can you master all these new strategies to get into the history of the Galaxy?